Dentists recommend you brush your teeth twice a day, so doesn’t it make sense that you should brush your pets’ teeth, too? You should brush your dog’s teeth every day, though most pet owners don’t adhere to that schedule. Because of this, experts estimate that approximately 80 percent of dogs suffer from some sort of oral pathology. 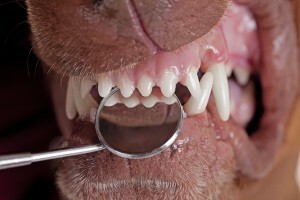 Some types of dental disease found in dogs include: gingivitis, or inflammation of the gums; periodontitis, a disease of the oral cavity; pyorrhea, inflammation of the gums and tooth sockets that often leads to loose teeth and pus; caries, decalcification of the tooth enamel, leading to cavities; plaque, buildup of material sticking to tooth enamel; and calculus, or tartar buildup. In honor of National Pet Dental Health Month, make sure your dog’s teeth are in good health. Symptoms of dental disease in dogs include bad breath, loose teeth, discolored teeth or teeth covered in tartar. In more severe dental cases, your dog may be bleeding from the mouth, lose their appetite or seem uncomfortable when you touch them near the mouth. Dental disease can cause damage to other areas of your pet’s body. Bacteria from your pet’s mouth can spread to a variety of other vital organs, including the lungs, kidneys, liver and heart, which can lead to serious infection or even death. Therefore, it’s important to make sure your pet’s teeth are always taken care of. First, you can start by getting a dental exam from your veterinarian. A vet will be able to identify if your pet currently suffers from any dental diseases, is at risk for developing any oral issues, or needs to have some teeth removed due to lack of care. After identifying any potential problems, it’s important to follow up by regularly maintaining your pup’s oral health. Many manufacturers sell special dental treats designed to scrape plaque from your dog’s teeth. We recommend Elk Antler Chews. When you come in for a visit, you can make sure to pick up a few! But dental treats aren’t enough to prevent your pup from developing any oral diseases in the long run. You should also spend time regularly brushing your dog’s teeth. Experts suggest doing so every day if possible, but at a minimum, to do so three to four times a week. We realize that not all pups adjust well to the process, and it can take a while for them to get used to having someone poke around in their mouths – especially if that person isn’t quite sure how to properly care for a dog’s teeth. That’s why we offer $5.00 teeth cleaning as part of our grooming service. Having a professional regularly clean your dog’s teeth allow us to work with you to keep your dog healthy and happy.